Someone who is bounteous in the giving of gifts is very generous. A mercenary person is one whose sole interest is earning money. A miserly person is so greedy that he hoards all his money and so spends as little of it as possible. When you procure something you obtain or get it in some fashion. The miser was filled with avarice as he greedily counted his numerous gold coins. His avarice knew no bounds—his only goal in life was to be the richest man in the land. His avarice for gold and great wealth soon had him working with criminal elements and for this he was thrown in prison. While wanting some money for comfort is not necessarily bad, no good can come from the avaricious pursuit of extreme financial gain. Quiz: Try again! What is avarice? The desire to show off your wealth and good fortune. The extreme desire to gather wealth and possessions. The desire to live alone without others to bother you. Boy's Rice Hunger Knows no Bounds Avi was greedy for rice, consuming 10 pounds a day in overwhelming avarice for the white grain, while also avariciously collecting one 50-pound bag per day to add to his growing hoard. One who is overcome by avarice has great “desire” or “is eager” for money, and so hoards it. 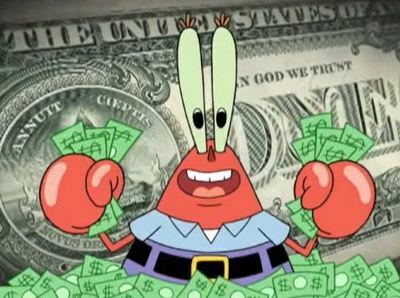 Nickelodeon Has Sponge Bob Talk about avarice!